Tuning by Tony is a piano tuning and repair service owned and operated by me, Tony Rodriguez. My attention to details, my passion for pianos, and my commitment to continued professional training make the difference. I am happy about what I do with your piano only when you are happy about your piano. My customers use adjectives like comprehensive, thorough, complete, and professional to describe my work. I tune, service, repair, and restore all major brands of pianos, and I expect to actively enrich my skill in piano technology for the rest of my life. Please check-out my website and click “book now” when you are ready to set up an appointment. I look forward to working with you and your piano! Mild-autism, or what many times is called Aspergers Syndrome, is a neurological reality that is a challenge for many people. It is especially challenging for those who are involved in any occupations or professions that involve customer service. A little compassionate awareness and understanding makes a big difference. Here are some files that describe piano repairs (for your curiosity!). If you are a customer, some of my condition reports will reference one or more of these files. Free free to look at any of the descriptions. My fully informed customers are my best customers. 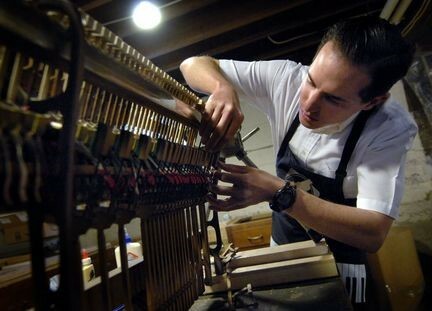 My three-step process is to thoroughly inspect each piano and its sound-making machinery, explain the services (if any) needed, and create an estimate of the service to be provided. My goal is to any and all of your piano needs! Click this link to learn more.